On August 22, 2017, the Hibben Church Council convened a special meeting to consider undertaking a Capital Fund Drive to address critical needs for our future. 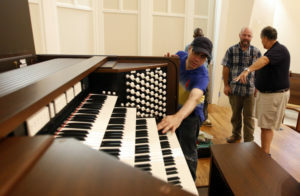 At the heart of this program is the need to replace our unreliable sanctuary organ. Simple repair was not a viable option. After a year of waiting, our new Allen organ is in place and will be consecrated October 14. Hibben leadership has concluded that in addition to the organ replacement, it was appropriate that we consider associated sanctuary improvements, capital facility upgrades to both the main sanctuary and CLLC buildings, and conclude debt retirement. Hibben leadership has established a campaign committee to help determine appropriate needs and communicate progress with the congregation. As the listing of necessary upgrades is comprehensive, we need all inclusive participation. We hope that as many congregants as possible will be able to serve in some capacity. We need your participation to make this dream a reality. Additional communications will follow. Hibben is in strong financial condition. Due to our generous and diligent members, we reduced our building mortgage to zero in just a few short years. In December of 2017, the debt was paid off! Funds previously applied to mortgage interest have been freed up to support our growing ministries. Giving has increased considerably (+$50,000 versus 2016 at this time). The generosity of our congregation has enabled Hibben to grow and make needed repairs to our extensive facilities. Committee chairpersons have been excellent stewards by achieving program objectives while maintaining expense within budget allowances. We are well positioned to take the next steps. Along with the new organ, it seems an appropriate time to renovate the altar area. Plans are not set but the overall goal is flexibility. The organ will be completely mobile, as will all other elements. This is to accommodate any type of need that may arise. From Christmas pageants to community events to Sunday mornings. The continuation of the Sanctuary lighting upgrade will be continued to include the altar. The Trustees were asked to list a few capital improvements. These are above what would be considered maintenance issues and upgrades. Some spotlighted areas include a sidewalk upgrade, a handicap ramp, the Vincent Street retaining wall and roofs for the Sanctuary and CLLC. These are fluid suggestions at the moment and may change as the campaign develops. The CLLC is closing in on 20 years old and therefore getting to the point of needing more than just maintenance. The lighting in the gym was just replaced at the beginning of October 2017. The gym floor refinishing was just finished and will last for years to come! We had a wonderful informational luncheon but we could still use your help! Steps Toward Hibben’s Future is intended to be inclusive. It touches many aspects of our ministry. Please consider being a part of this exciting program by providing your talents at this critical time. contact, and many other means we have yet to consider. Please contact Amanda Moore if you are interested in helping this area. We want to accommodate as many aspects of worship styles and special events as possible. We want flexibility. Trustees have identified critical needs. We need additional input to insure our list is accurate and priorities are set. Please contact Steve Bare to help in this area. ministries, special events and contemporary worship experience? Please contact Tim Ristau to help in this area. Contact Tim Ristau with questions. Pledge cards will be sent through the mail in November. To make pledges outside of that window, contact Business Manager Candace Dellinger at cdellinger@hibbenumc.org. Donations can be made on our giving page.